For the past several days, we've been following the story of Apple's removal of AppGratis from the App Store. 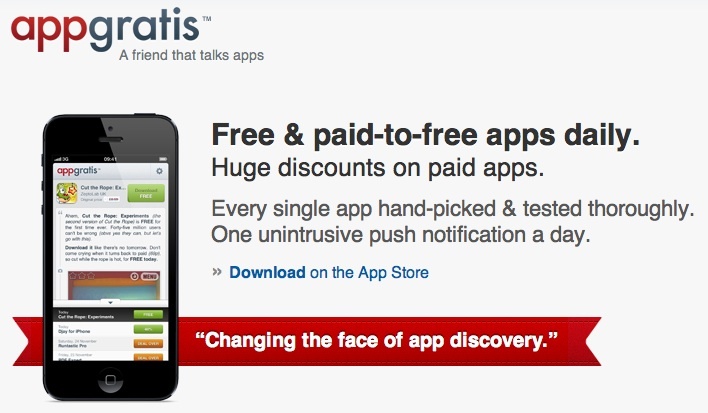 AppGratis offers a popular app discovery service with the main feature being a hand-picked app offered free each day. Apple acknowledged that it had pulled the app for violating two App Store rules related to offering apps in a manner which might be "similar to or confusing with the App Store" and using push notifications to send out promotions. AppGratis CEO Simon Dawlat responded yesterday to note that Apple had approved the app a number of times, including an iPad version just a week ago, before a new reviewer stepped in and quickly pulled the app after being unable to contact Dawlat, who was on an airplane at the time. AllThingsD now reports that Apple's removal of AppGratis is just the first step in a broader crackdown on such apps, with more app discovery services soon to be pulled as well. I’m told Apple feels these apps threaten the legitimacy of the App Store charts by providing a way for developers to spend their way to a high ranking. Apple did something similar in 2011, when it rejected a number of applications running incentivized app installs within their apps. that’s similar to walking into Nordstrom and seeing a Walmart inside. AppGratis notes that it is "far from finished" and that its 12 million existing users will be able to continue to use the app while the company explores its alternatives, but AllThingsD makes clear that the removal of AppGratis was not simply an error on the part of a reviewer and that AppGratis is "almost certainly finished as an iOS app — in its current incarnation, anyway". Apple is only hurting the consumer with this one, especially with the current state of the app store in iOS6. Couldn't they just do a web-app and that way get around the restriction? The app anyway sounds like something that should be an web app. that's similar to walking into Nordstrom and seeing a Walmart inside. So Apple does the same thing in real stores .... so why can Apple do it in the 'real world' without confusing customers, but think it would confuse customers in the digital world ? Apple should add a new category for AppStore alternatives and they might even increase their revenue by doing that. Not really funny. That was the point of AppGratis. Free app promotions. If Apple had a better app discovery mechanism then all these apps wouldn't be necessary. At worse, this particular app and others could be turned into a mobile webapp.. out of the reach of Apple. I use these to find those apps that have reduced prices / gone free. Doesn't AppShopper do the same thing? Yet it's still going strong and hasn't been removed. AppShopper was removed a few months ago - for the same reason. I think it means free in many western European languages since it is originally a Latin word. Except Best Buy isn't giving Apple free space in its store. Why don't you try walking into Best Buy and setting up shop inside their store and see how far you'll get.